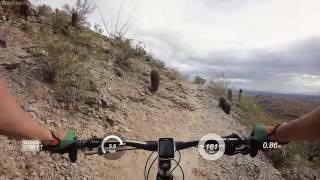 To create this loop, take the Javelina Canyon Trail to Mormon Loop Trail to National Trail to Kiwanis Trail to Las Lamitas to Holbert Trail to 7th Street to Dobbins Road to 20th Street to Euclid Avenue to 24th Street to Mormon Trail to Mormon Loop Trail to National Trail to Pima Canyon Road to Beverly Canyon Trail. 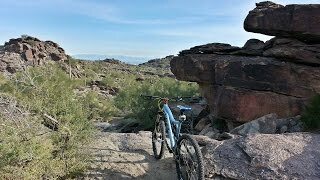 To get this up to 95% singletrack, take Holbert Trail up to National Trail then down Geronimo Trail and then take the road over to Mormon Trail at 24th Street. You may want to consider riding this loop in the counter clockwise direction. ride this in the direction. National Trail is a hike-a-bike most of the way up so it might be better to ride counterclockwise to avoid this ascent. 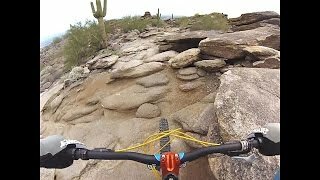 100% singletrack loops on South Mountain are hard to come by. This route will get you 90% of the way there mixed with some of the most technical terrain the mountain range has to offer. The Javelina Canyon Trail will warm you up for the National Trail. Then get ready for some fairly decent sized chunk down Kiwanis Trail and a seriously stiff technical climb up Mormon Trail. Finish up this beast with Mormon Loop Trail and Beverly Canyon Trail to cool down your legs and lungs. East national overlooking Phoenix below. Quick pic along National Trail. National Trail up from Mormon Loop. 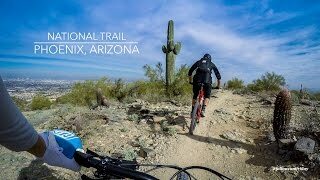 Classic desert riding along National Trail.